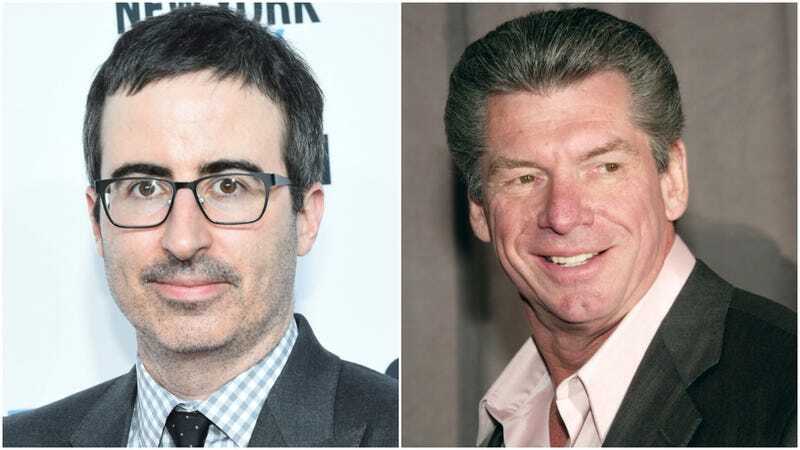 The WWE smells what John Oliver is cooking, but it won’t sniff it lying down. The wrestling juggernaut has released a statement (via Deadline) in response to Oliver’s fierce, funny takedown on last night’s Last Week Tonight, in which the comedian criticized the WWE for its inhumane treatment of the wrestlers who break their bodies day in and out for the company. That’s a pretty weak response to Oliver’s 23-minute segment, which was backed by statistics, wrestler testimonials, and passages from official WWE documentation. They’ve even invited him to “learn more about our company” by attending this weekend’s Wrestlemania. While Oliver would no doubt enjoy the spectacle—if there’s one thing his segment made clear, it’s that he’s a fan of the product—he’s wise enough to know that he’d be eating a steel chair the moment he walked by McMahon’s office. The CEO is likely still smarting from Oliver’s piece about the WWE’s partnership with Saudi Arabia. In a just world, WWE would heed the words of the late, great Owen Hart: “Enough is enough and it’s time for a change.” Instead, McMahon will likely echo John Cena’s “you can’t see me,” scurrying back into the gym until this all blows over. That is, of course, unless fans get more vocal about their desire for better working conditions. You can’t ignore the chants forever. Even WWE superstars are out here covering A Star Is Born&apos;s "Shallow"